Although both Kleinian psychoanalysts and their critics take it for granted that there is a therapeutic technique distinctive to the Kleinian approach, comparatively little has been written about what it is. 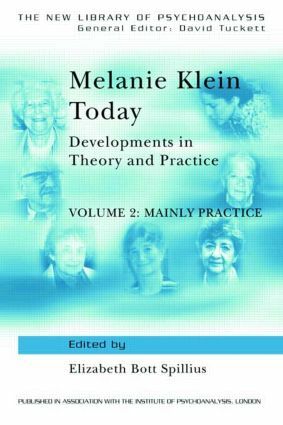 In Melanie Klein Today, Volume 2, Elizabeth Bott Spillius brings together classic and new papers to make it possible to understand the main elements of the Kleinian therapeutic technique. In recent years there have been important refinements in this technique, notably in regard to the balance to be struck in interpreting destructiveness, the use of the so-called part-object language, and the precise ways to understand and interpret 'acting-in' and the role of the past in the present. This collection draws these developments together and makes clear why an integral part of contemporary Kleinian theory and practice is concerned with the careful scrutiny of the therapeutic process itself. The volume includes detailed accounts of clinical work with both adults and children and takes further the theoretical ideas discussed in Melanie Klein Today, Volume 1. The papers and the editorial commentary in this book together comprise the most illuminating and coherent rationale for the Kleinian technique yet published. The ideas will be of interest to members of many disciplines and a final section includes papers on the application of the Kleinian approach in other fields of work.